← Happy Little Rich Girl. Here in Australia we have a new government that seems to be in serious denial of issues such as climate change, methinks that such a government is probably not going to be very supportive of the renewable energy industry either. One could get depressed over this kind of ostrich behaviour, but luckily there are things going on in the wonderful world of human inventiveness that gives one hope in this fossil fuel dominated culture. There are a growing number of windfarms around the world, with the biggest being found in China and America, the windmills are huge and there are a lot of them so they can only be placed in rural areas. They’re doing a great job of providing energy, and are an important part of the renewable energy industry, but what if you could have your own personal wind generator in your home, and I’m talking about cities and suburbs here. Enter the Windspire, instead of propellers they have vertical airfoils and stand 9 metres high, according to the manufacturer they can produce 25-30% of the power needs of a household. Apparently they got the idea from an Egyptian structure that was being used 3000 years ago to grind wheat, it just goes to show, there’s nothing new under the sun, even in the area of technology! 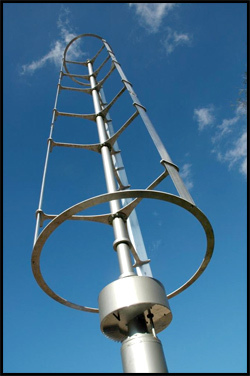 The Windspire is quiet and it can be connected via wireless to your computer so you can keep track of how much power it is generating. Here is a short clip from the Mariah Power company about the Windspire, whatever the practical realities it’s very inspiring to watch, and one hopes that it will be part of the new and cleaner world that simply must arrive soon, if we are to survive on this beautiful planet! This entry was posted in Uncategorized and tagged energy, fossil fuels, power, renewable energy, Windfarms, Windpower, Windspire. Bookmark the permalink.